Preston Sparks holds a sign he made that rechristens the Idyllwild Dog Park as the Rick Barker Dog Park. Sparks also made a bench in Barker’s honor. 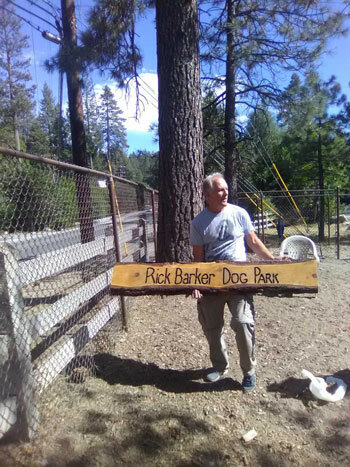 Rick Barker, much-loved Idyllwild author and community volunteer, served on the Idyllwild Community Center board and was an advocate for the Idyllwild Dog Park, now under ICC management. Preston Sparks, local actor, craftsman and community volunteer, recently installed a memorial bench he created to honor Barker, who died this year on Jan. 20. Sparks said that while he was crafting the bench, there were moments when he strongly felt Barker’s presence. “I got a chill, the hair was standing up on my neck,” said Sparks. “He was there.” Sparks carved the sign naming the park as a living memorial in Barker’s honor. Barker and his dog Stavro were frequent visitors to the park. He volunteered his time for ICC as part of his commitment and connection to Idyllwild and its people. For Sparks and others in our dog-centric community, the newly-named Rick Barker Dog Park will be a place to feel that connection and celebrate that commonality.